With all the hustle and bustle going in our holiday kitchens, this make ahead, no-bake recipe for pecan pie bars will be a welcome addition to your family's dessert repertoire. These nearly raw yet rich pie bars capture the nuttiness and creaminess found in traditional pecan pie recipes, but without the cloying sweetness (or any eggs or corn syrup). 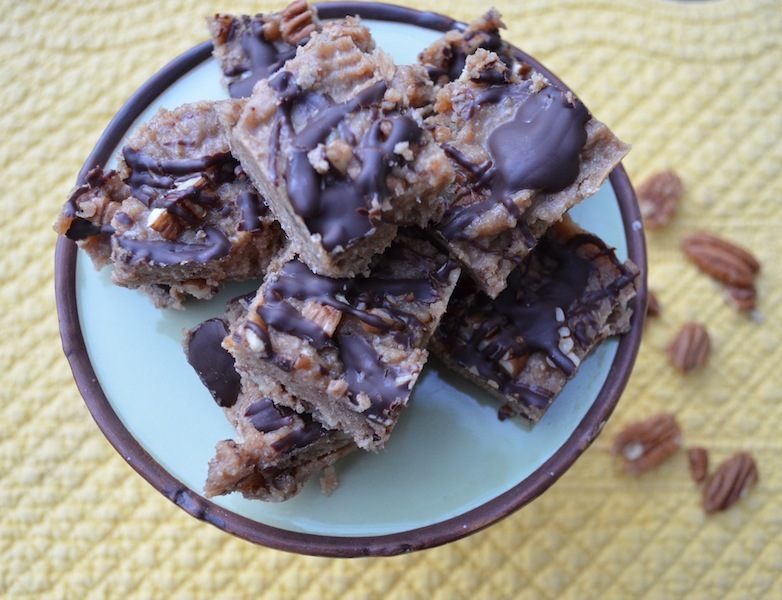 Cut into small squares, these bars are a sweet treat for after decadent holiday meals or even for a little midday pick me up. Each of the three layers contains pecans, which add fiber and Vitamin E, and the crust and filling are sweetened only with a little maple syrup and dates. A chocolate drizzle on top of the bars goes a long way into enticing family members to try a slightly untraditional take on a favorite holiday pie. 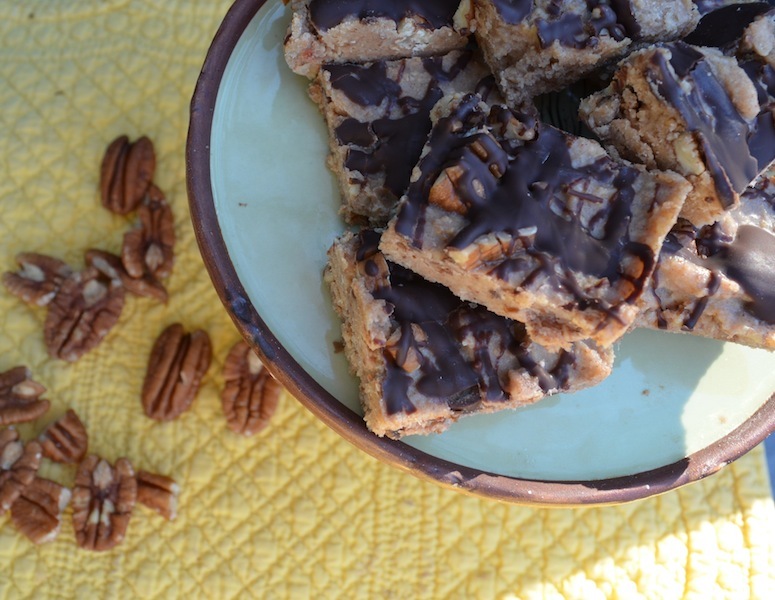 These pecan pie bars are very portable, so they are perfect for adding to any festive spread you attend, whether you are hosting any of this year's holiday meals or are simply a lucky guest. Read on for a no-bake pecan pie bar recipe that brings together the flavors of the season with the delicious nuttiness of the pecan. Soak all of the dates in hot water for an hour so that they are softened. Cut a piece of parchment paper to fit the bottom of an 8 x 8 inch baking pan and place inside. This will keep the bars from sticking to the bottom of the pan later. 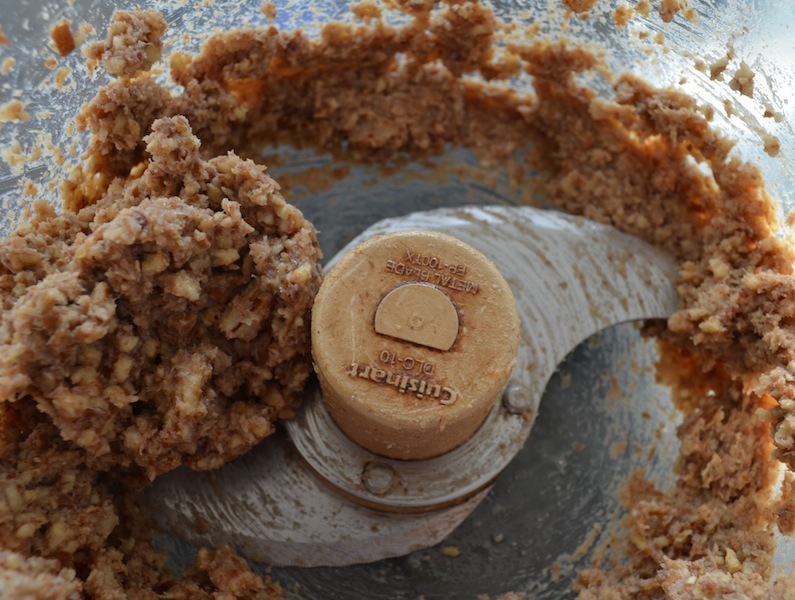 Add 3/4 cup of the dates, 1 cup pecans, 1 tsp liquid coconut oil, and a pinch of salt to a food processor and pulse until a dough firms. The mixture will stay a little chunky, but the dough should stay together if pinched. 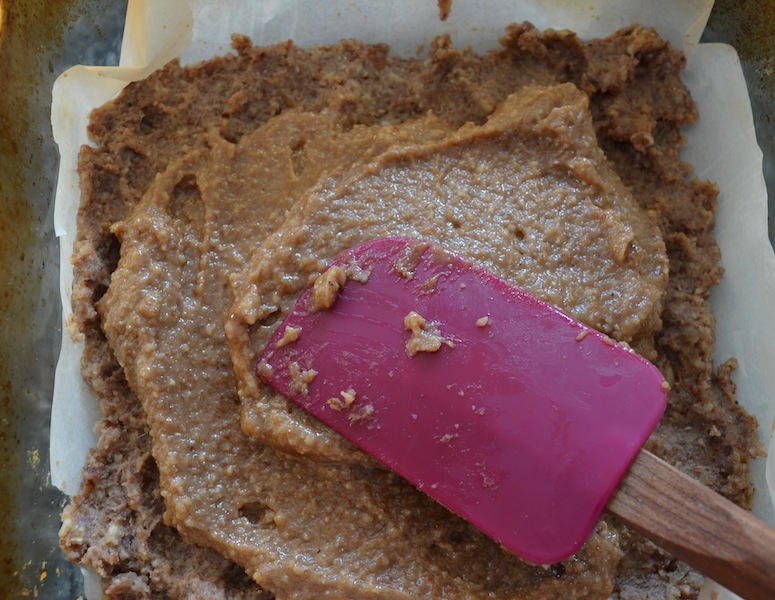 Spread the crust into the prepared baking pan, pressing down with your fingers and smoothing it out so that you have an even layer covering the bottom. 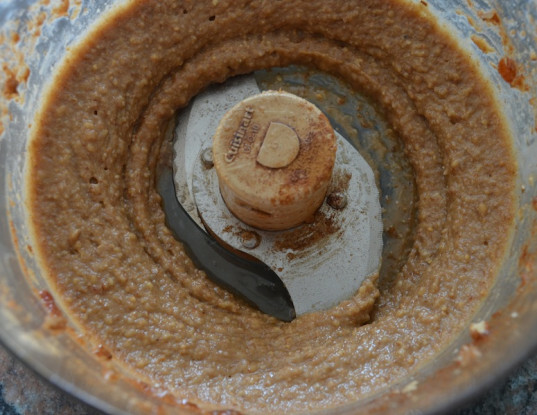 Clean out the food processor bowl used for making the crust. Then place the remaining 1/4 cup of soaked dates, 1/2 cup pecans, 1/4 cup liquid coconut oil, maple syrup, cashew butter, cinnamon, and nutmeg into the food processor. Process until smooth. 5. Spread the filling on top of the crust. Scoop the filling on top of the crust and cover the crust, using a spatula to smooth out the top. 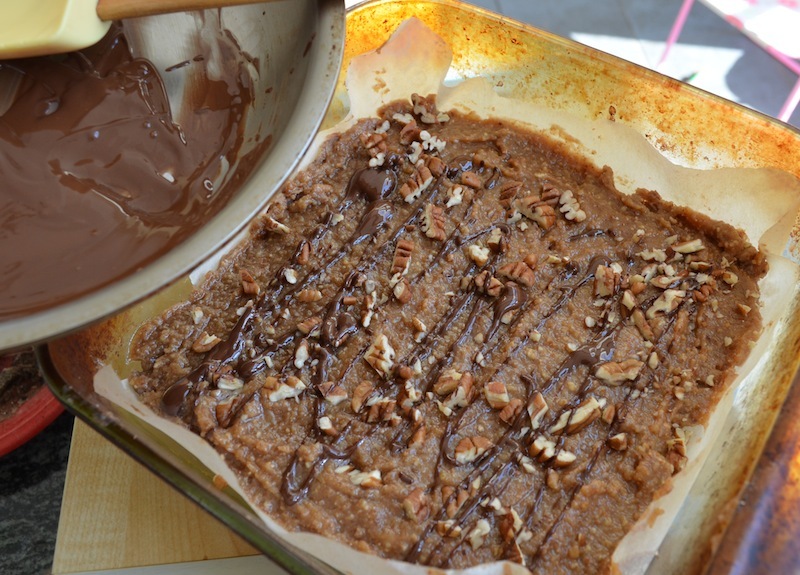 Cover the baking pan and freeze while you prepare the pecans and chocolate drizzle. 6. 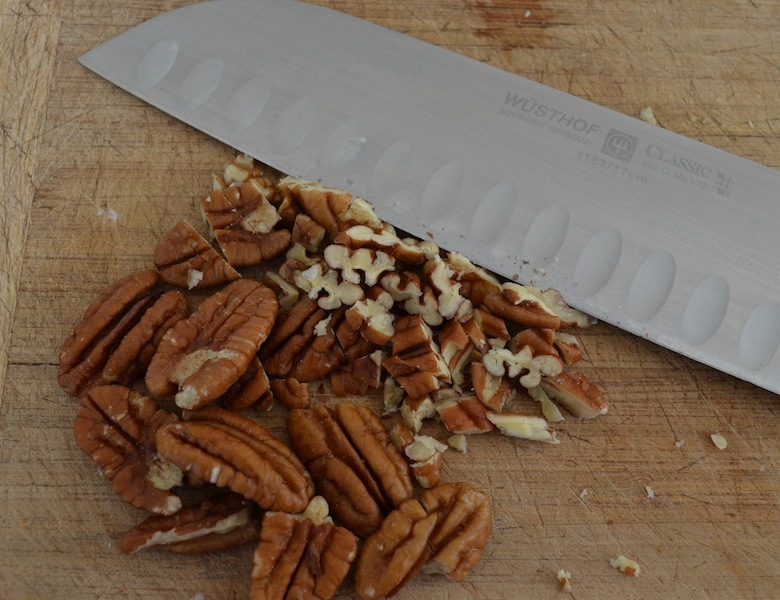 Chop pecans for decorating. 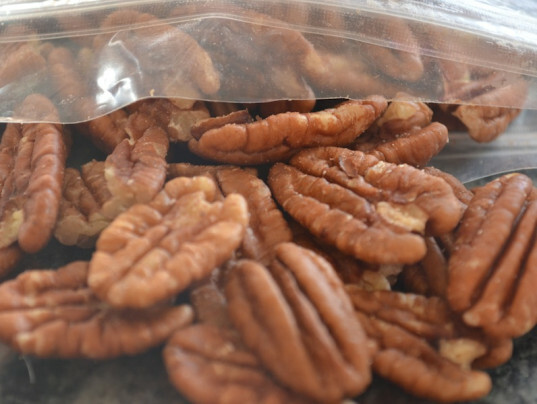 Chop pecans into small pieces (but not so small that they start to become little shards) for sprinkling on top of the pie filling for added crunch and another layer of nutty yumminess. 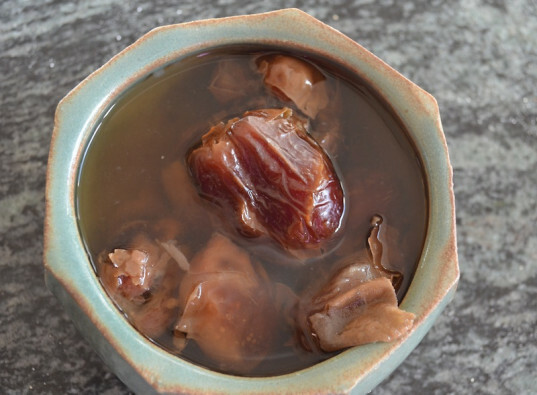 In a small saucepan, heat the coconut oil and chocolate chips over medium to medium-low heat, stirring frequently to keep the chocolate from burning and to help the chips melt. Once the chocolate is melted, remove from heat. Remove the baking pan from the freezer, drizzle on the melted chocolate and sprinkle on the pecan pieces. 8. Refrigerate or freeze, but don’t forget to cut the pieces. You can either refrigerate or freeze these bars. (I tried both methods and both worked). Simply place the covered bars in the fridge or freezer for at least 3 hours. After an hour or so, remove the pan just so that you can cut the pecan pie bars into pieces. This step is more critical if you are freezing the bars because they will be hard to cut once they have been frozen for a while. I made 25 small pieces. 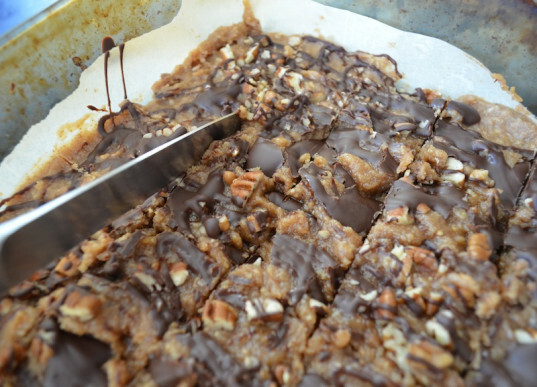 Remove the bars from the baking pan and serve. If freezing the bars, set them out about 15-20 minutes before serving so that they won’t be too frozen and chewy (unless you want to serve them as freezer fudge!) Enjoy! These bars will keep for at least 3 days in the fridge and a few weeks in the freezer. 8. Refrigerate or freeze, but don't forget to cut the pieces. Remove the bars from the baking pan and serve. If freezing the bars, set them out about 15-20 minutes before serving so that they won't be too frozen and chewy (unless you want to serve them as freezer fudge!) Enjoy! These bars will keep for at least 3 days in the fridge and a few weeks in the freezer.